In recent years, housing trends have gone toward smaller spaces and minimalist designs. Senior living communities have followed suit, catering to older adults looking to downsize, minimize and simplify. However, a recent article in Senior Housing News suggests the next generation of senior living residents — baby boomers — may want something different. The article summarized survey findings conducted by senior living design firm AG Architecture. The results were clear: Retirees want senior housing with more space for dining, entertaining and storage. They’re looking to downsize in moderation — they’d prefer to exchange their four-bedroom house for a spacious, two- or three-bedroom apartment or cottage rather than a small studio or one-bedroom unit. With bigger senior living units, residents have the space to host guests, pursue hobbies and store valuable items without the hassle and responsibility of home ownership and maintenance. This is the same vision we had in mind when we designed The Avenues Crofton Park, a 55+ community in Broomfield, Colorado. With one-, two- and three-bedroom layouts, residents can choose apartment floor plans and cottage floor plans to fit their lifestyle needs. 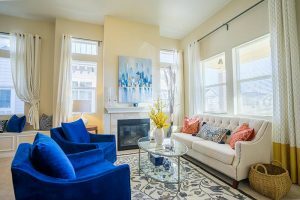 Select floor plans even include a separate dining room or den, perfect for entertaining or creating a unique space for activities or relaxation. Each unit has its own private, covered balcony or patio, and expansive windows for natural lighting. Many of our residents have also commented on how spacious our apartments and cottages truly are. With open floor plans, walk-in closets and walk-in showers, residents who use wheelchairs, walkers or other assistive devices appreciate not feeling cramped or restricted as they move around their living areas. For those looking for even more space, as well as a greater sense of privacy, The Avenues Crofton Park offers senior cottages that provide the benefits of independent living without the responsibilities of home ownership. Like our apartments, our cottages come in different layouts, including a two-bedroom, two-bathroom floor plan as well as a three-bedroom, three-bathroom floor plan. Both feature main-level master suites for easy access and full kitchens with modern appliances and amenities. Spacious walk-in closets, single-car attached garages and other storage areas allow residents to keep what’s important to them when making the move to senior living. We know older adults don’t want a one-size-fits-all approach to senior living — they want options as diverse and unique as they are. Whether you’re looking to downsize to an apartment or a smaller home, we encourage you to begin exploring senior living options in your area to find the one that’s right for you. If you’re interested in learning more about what we offer at The Avenues Crofton Park, we’d love for you to stop by and visit sometime. For more information about our community or to schedule a tour, please fill out our online form or contact Corné Lewis at 720-799-0915.